Ingrown toenails can be very painful. They occur when one or both sides of a nail dig into the skin next to the nail. Ingrown nails can be hereditary, or they may result from trauma or injury, or from shoes that fit improperly. They can be treated in the office that same day, and the severity of the problem determines the type of treatment that we will employ. 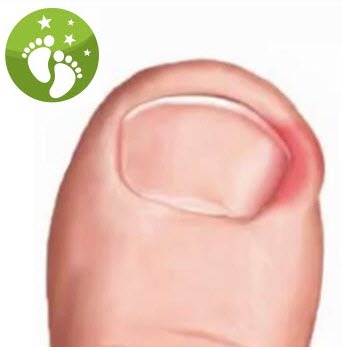 There is also a way to permanently correct an ingrown nail right in the office, so that the ingrown portion of the nail does not grow back and cause a problem in the future. If left untreated, an ingrown nail can become infected which can lead to other potential problems. Give us a call to allow us to help you with this painful condition. You may reach us at 586-298-1585. As mentioned above, ingrown nails can cause infection. Visit our infection page for more information.